Glucosamine-mediated knockdown resulted in an apparent block at the early trophozoite stage. There was reduced protein export. Parasites could recover upon glucosamine removal after shorter periods of knockdown. PTEX components are apically localised in merozoite dense granules. (A and B) Immunofluorescence assays were completed during schizogony and were probed for either PTEX components or markers of distinct organelles as indicated in each of the panels. 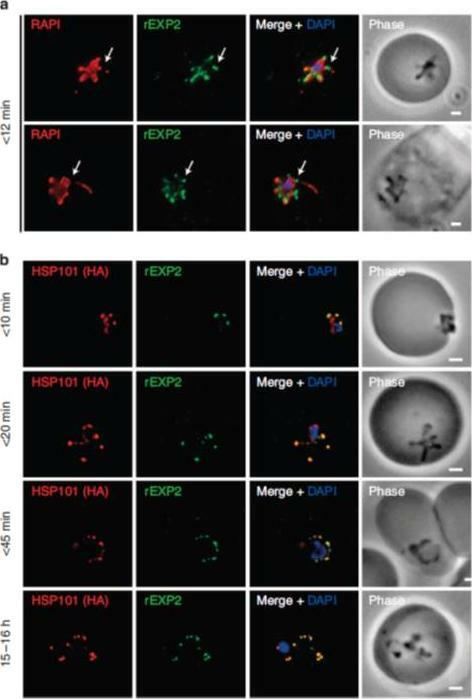 (A) Merozoites probed with antibodies specific to both HSP101 and EXP2 demonstrate apical localization for both proteins. 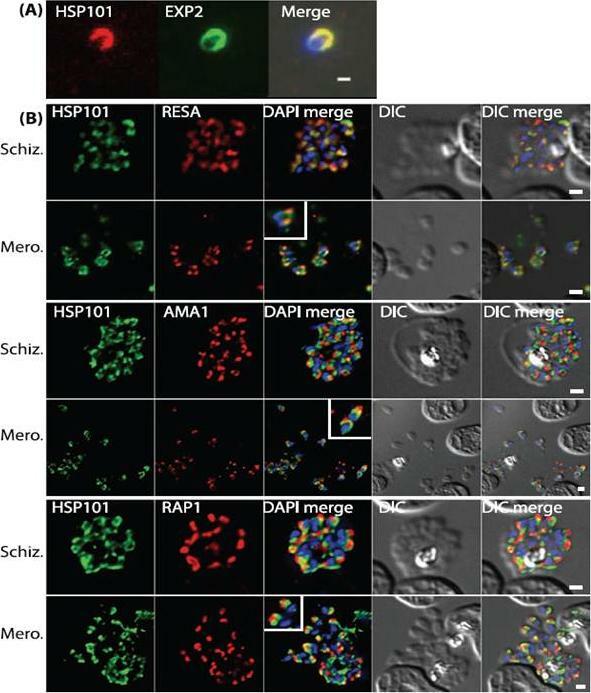 (B) Schizonts and merozoites were labeled with antibodies specific to HSP101 and either RESA (dense granules), AMA1 (micronemes) or RAP1 (rhoptries). Co-localisation quantitation reveals that HSP101 localises most closely with dense granule associated RESA (top two panels). Scale bar: 1μm. Bullen HE, Charnaud SC, Kalanon M, Riglar DT, Dekiwadia C, Kangwanrangsan N, Torii M, Tsuboi T, Baum J, Ralph SA, Cowman AF, de Koning-Ward TF, Crabb BS, Gilson PR. Biosynthesis, localisation and macromolecular arrangement of the Plasmodium falciparum translocon of exported proteins; PTEX. J Biol Chem. 2012 287(11):7871-84. EXP1 localizes to PVM domains with PTEX. Parasites were fixed at <15 min, 60–90 min and 20–21 h after invasion and labelled by IFA for EXP1 (red), EXP2 (green) and the nucleus (40,6–diamidino-2-phenylindole (DAPI), blue). (a) Imaging of all samples by widefield deconvolution microscopy (scale bar, 1 mm). 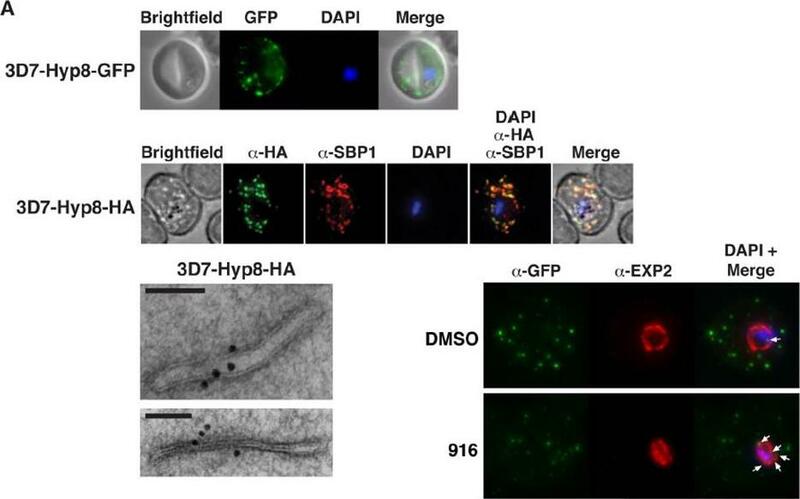 when EXP2 localization was compared with that of a DRM-enriched protein, the exported protein 1 (EXP1), clear co-incidence of fluorescence was seen using widefield deconvolution microscopy of parasites fixed <15 min, 60–90 min and 20-21 h post invasion, although EXP1 appeared to become more widely distributed around the PVM in the latter sample.Riglar DT, Rogers KL, Hanssen E, Turnbull L, Bullen HE, Charnaud SC, Przyborski J, Gilson PR, Whitchurch CB, Crabb BS, Baum J, Cowman AF. 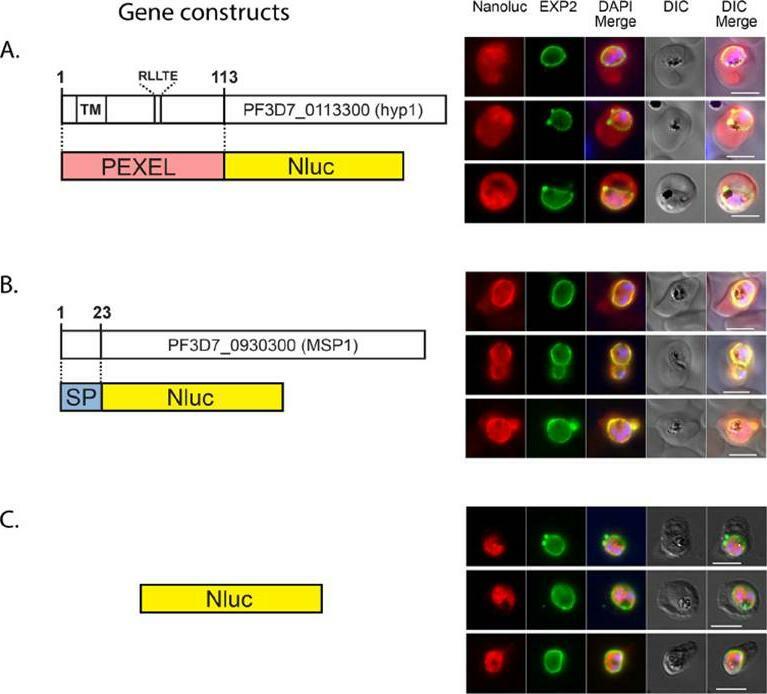 Spatial association with PTEX complexes defines regions for effector export into Plasmodium falciparum-infected erythrocytes. Nat Commun. 2013 Jan 29;4:1415. Localization of PfPV-1 in IRBCs. Trophozoite-IRBCs were spread onto microscope slides. 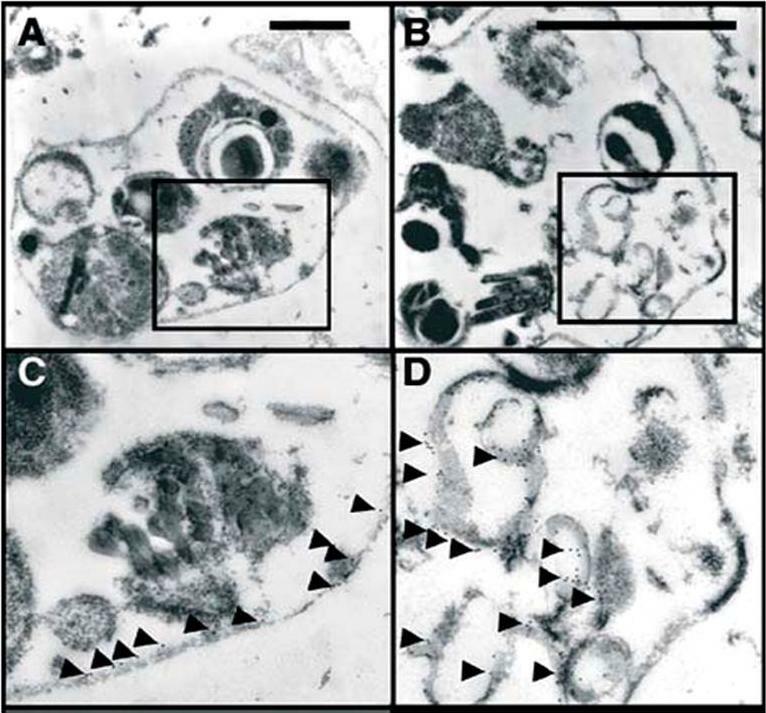 Cells were fixed and incubated with mAbs that were directed either against the band 3 protein of the erythrocyte membrane (A), against the vacuolar marker protein PfEXP-2 (B), or against the Maurer’s clefts marker protein PfSBP1 (C). All slides were also incubated with the polyclonal antiserum against PfPV-1. Binding of the mAbs was monitored with Cy3 conjugated anti-mouse secondary antibodies (red), and binding of the polyclonal antiserum was monitored with Cy2 conjugated anti-rabbit secondary antibodies (green). 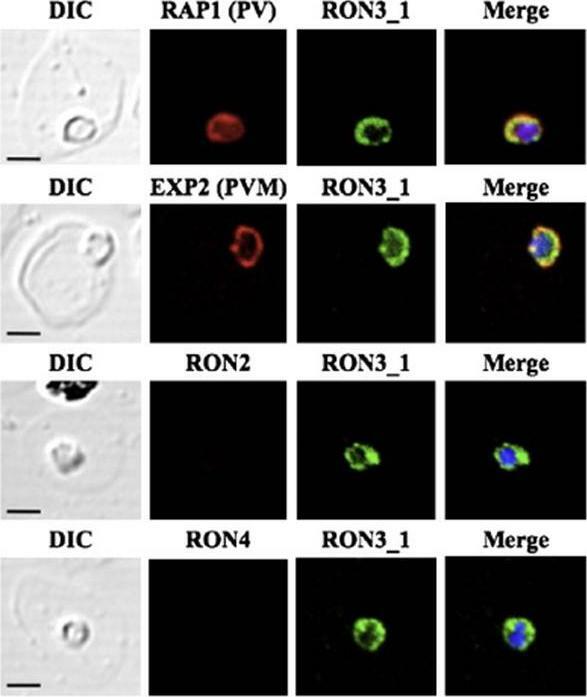 PfPV-1 is concentrated in a distinct ring surrounding the parasite cell, and this location is distinct from that of the erythrocyte membrane (A). It colocalizes with the vacuolar marker protein PfEXP-2 (B) and with PfSBP1 (C), suggesting that it is present not only in the PV but also in Maurer’s clefts.Nyalwidhe J, Lingelbach K. Proteases and chaperones are the most abundant proteins in the parasitophorous vacuole of Plasmodium falciparum-infected erythrocytes. Proteomics. 2006 6:1563-73. Immunolocalisation of (A) glycophorin A and B by monoclonal antibodies (purchased from Sigma, St. Louis, USA) and (B) EXP-2 using a specific antiserum was performed with mature iRBCs incubated with 10 mM bADA for 10 h prior to fixation and electronmicroscopy. (C,D) Enlarged regions of (A) and (B), respectively, as indicated by frames. Immunogold labeling is indicated by arrowheads. EXP-2 is a parasite protein of the PVM. During merozoite release, it became apparent that the merozoites were enveloped by the red blood cell plasma membrane. However, the PVM was found to be lysed; fragments of the PVM were found inside the clusters between the merozoites as membranous whorls.Gelhaus C, Vicik R, Schirmeister T, Leippe M. Blocking effect of a biotinylated protease inhibitor on the egress of Plasmodium falciparum merozoites from infected red blood cells. Biol Chem. 2005 386:499-502. Copyright Walter de Gruyter GmbH 2009. Two upper rows: PTEX components are apically localised in merozoite dense granules. Immuno-electron microscopy of isolated D10 merozoites labeled with anti-EXP2 antibodies and (D) isolated PTEX150-HA merozoites labeled with anti-HA antibodies indicate that immunogold labels (yellow triangles) localize to dense granules (DG), and not the rhoptries (Rh). 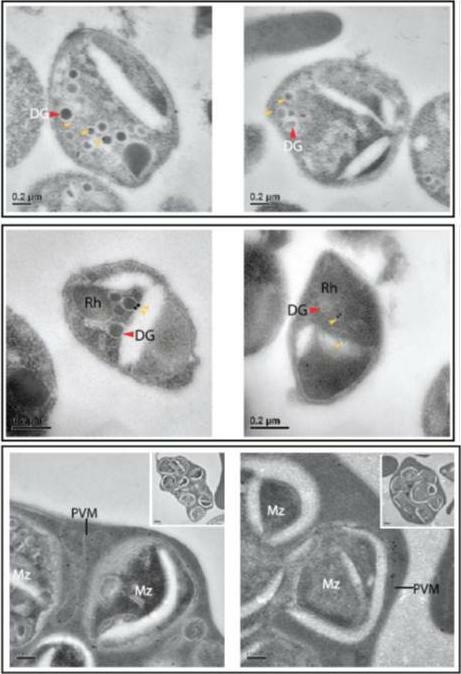 Lower row: Immuno-electron microscopy of unfiltered D10 merozoites within the erythrocyte clearly resolves the PVM from the merozoite (Mz) plasma membranes. High magnification of anti-EXP2 antibody labeling localized EXP2 to the PVM (with low magnification of the entire unfiltered cell provided in the inset), indicating that it is not a plasma membrane protein and that it remains on the PVM until the point of parasite egress from the erythrocyte.Bullen HE, Charnaud SC, Kalanon M, Riglar DT, Dekiwadia C, Kangwanrangsan N, Torii M, Tsuboi T, Baum J, Ralph SA, Cowman AF, de Koning-Ward TF, Crabb BS, Gilson PR. Biosynthesis, localisation and macromolecular arrangement of the Plasmodium falciparum translocon of exported proteins; PTEX. J Biol Chem. 2012 287(11):7871-84. Immunoelectronmicroscopical localization of exp-2. Labelling with McAb7.7 alone (F) was followed by silver enhancement. In double-labelling studies (E, G), localization of PcAb5.1 is shown by larger, 20 nm particles; localization of McAb7.7 by 5 nm particles. (E) Co-localization of McAb7.7 and PcAb5.1 at the surface of an early schizont. Note association with a mass of dense material (lower right). (F) Localization of McAb7.7 to a membranous cleft in the erythrocyte cytoplasm (right) and low labelling of the parasite cytoplasm (left). (G) Co-localization of McAb7.7 and PcAb5.1 to a vesicular structure in the cytoplasm of an infected erythrocyte, double-labelled. (H) Plasma membrane of the RBC and intraerythrocytic membranous cleft, showing restriction of band 3 protein to the red cell surface.Johnson D, Günther K, Ansorge I, Benting J, Kent A, Bannister L, Ridley R, Lingelbach K. Characterization of membrane proteins exported from Plasmodium falciparum into the host erythrocyte. Parasitology. 109 ( Pt 1):1-9. Copyright Cambridge University Press. 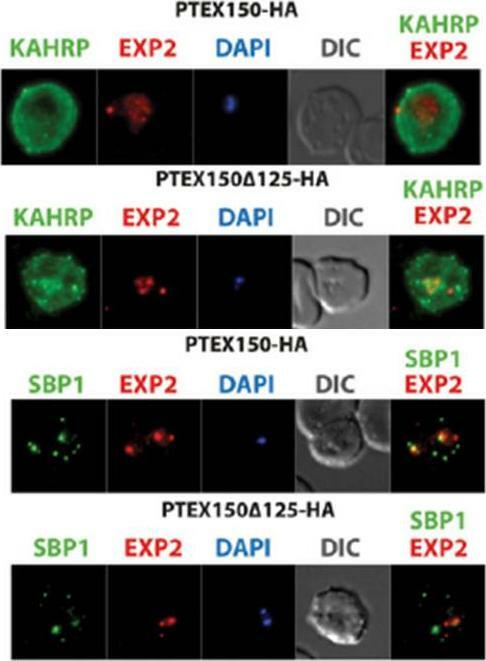 Protein accumulates at sites marked by PTEX during native PEXEL-dependent protein export. 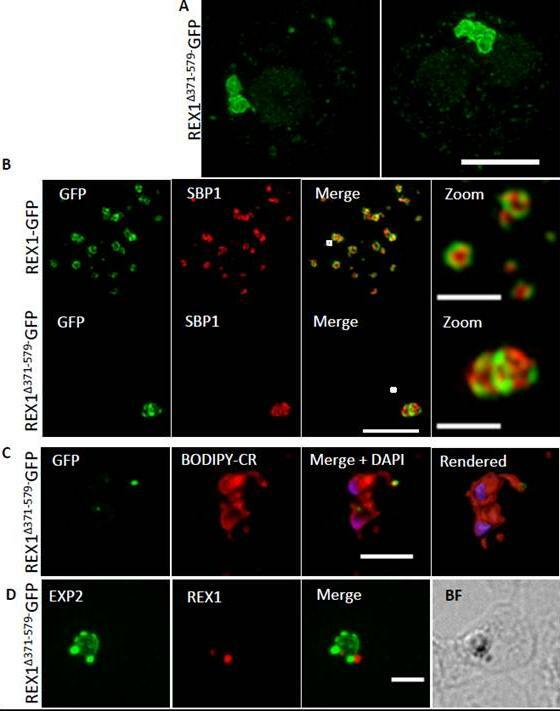 Widefield deconvolution microscopy of parasites fixed and labelled by IFA for EXP2 (green), the nucleus (40,6–diamidino-2-phenylindole (DAPI), blue) and (a) PfEMP3 (red), a protein exported by PEXEL-dependent processes, or (b) PfEMP1, a protein likely to undergo PEXEL-independent export, showed some areas of possible association of both exported proteins and EXP2; however, results were inconclusive. Parasite ages are as shown. Scale bars, 1 mm. Parasites were labelled by IFA for EXP2 (green), RESA (red) and the nucleus (DAPI, blue) having been (c) fixed o12 min or 60–90 min after invasion and imaged by widefield deconvolution microscopy (scale bar, 1 mm).Riglar DT, Rogers KL, Hanssen E, Turnbull L, Bullen HE, Charnaud SC, Przyborski J, Gilson PR, Whitchurch CB, Crabb BS, Baum J, Cowman AF. 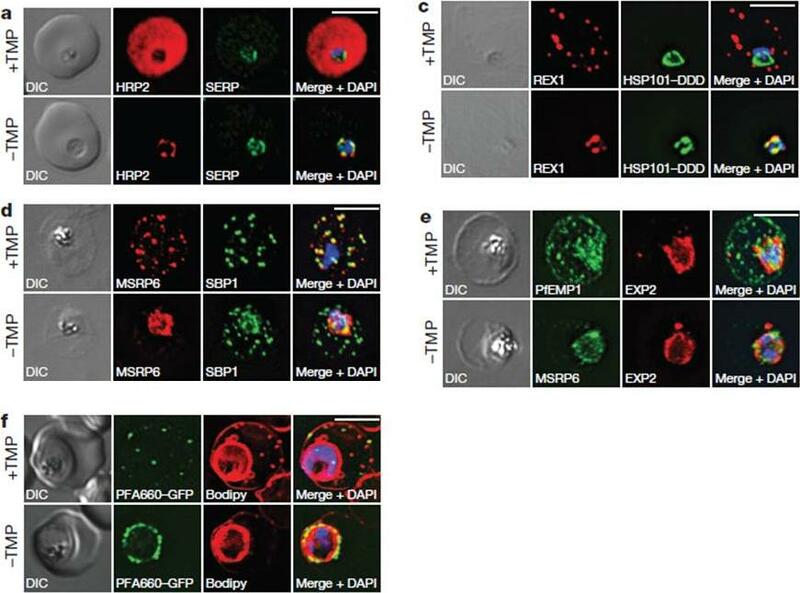 Spatial association with PTEX complexes defines regions for effector export into Plasmodium falciparum-infected erythrocytes. Nat Commun. 2013 Jan 29;4:1415. 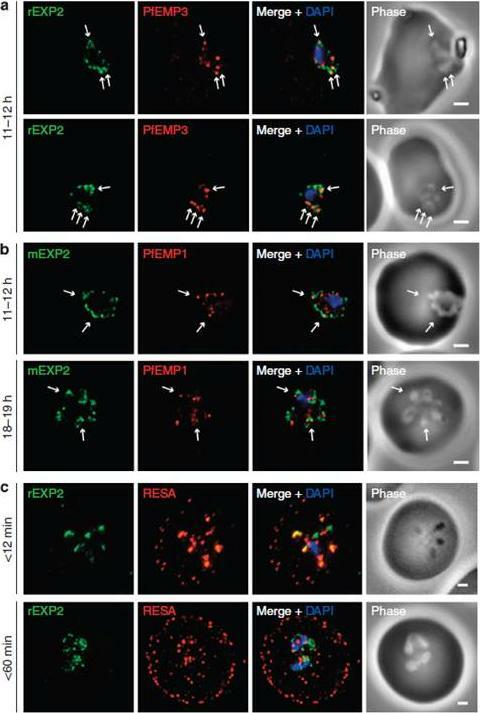 PTEX components localize to the parasite periphery immediately following invasion. 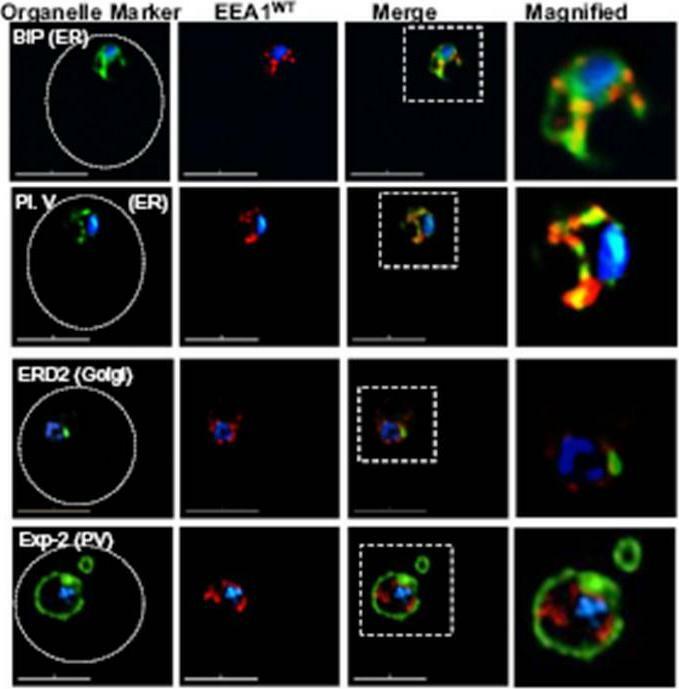 (a) Widefield deconvolution imaging of parasites fixed o12 min following erythrocyte invasion and labelled by IFA for EXP2 (green), the PV (RAP1, red) and the nucleus (40,6–diamidino-2-phenylindole (DAPI), blue) showed EXP2 localized in puncta at the parasite periphery at this time point (scale bar, 1 mm). 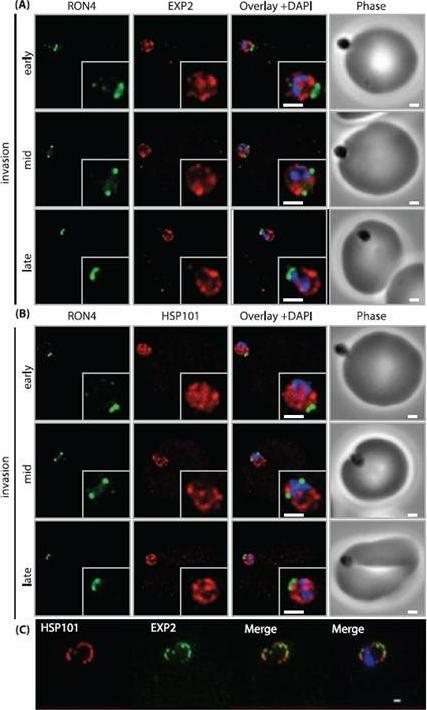 HSP101HA parasites were fixed o10 min, <20 min, <45 min and 15–16 h following erythrocyte invasion and labelled by IFA for EXP2 (green), HSP101HA (HA, red) and the nucleus (DAPI, blue). (b)Widefield deconvolution microscopy (scale bar, 1 mm).Riglar DT, Rogers KL, Hanssen E, Turnbull L, Bullen HE, Charnaud SC, Przyborski J, Gilson PR, Whitchurch CB, Crabb BS, Baum J, Cowman AF. 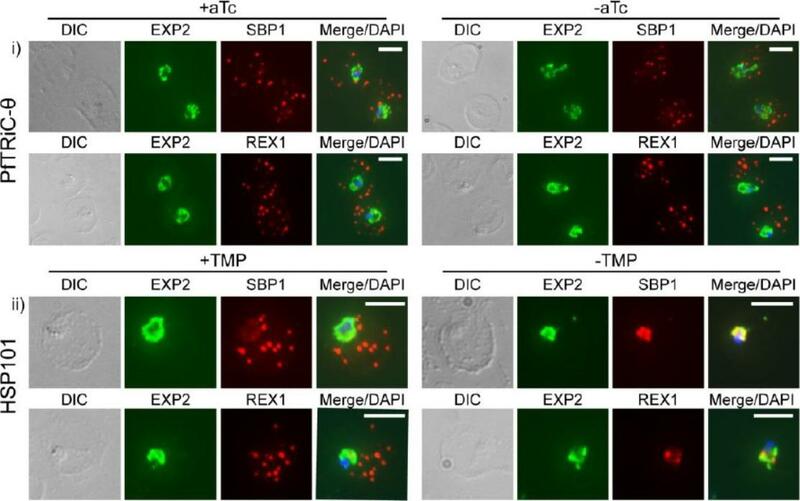 Spatial association with PTEX complexes defines regions for effector export into Plasmodium falciparum-infected erythrocytes. Nat Commun. 2013 Jan 29;4:1415. Localization of EEA1WT-mCherry as a marker for PI(3)P (phosphatidylinositol-3-phosphate) in the parasite ER. EEA1 = early endosomal antigen 1. Transgenic parasites transfected with EEA1 were fixed, permeabilized and probed with anti-mCherry as well as antibodies to endogenous P. falciparum markers (green) of the ER, like BIP (top row) and plasmepsin V (Pl. V, second row); a marker of the Golgi (ERD2, third row) or the PVM (Exp-2, bottom row). EEA1WT (red) is seen in punctuate ‘spots’ within the ER. Dotted circles show location of red cell membrane. Dotted squares show regions magnified in the right panels. Parasite nuclei were stained with Hoechst 33342 (blue). Scale bars, 5 mm. The overlap between markers and EEA1 indicates the presence of PI(3)P in the respective regions.Bhattacharjee S, Stahelin RV, Speicher KD, Speicher DW, Haldar K. Endoplasmic Reticulum PI(3)P Lipid Binding Targets Malaria Proteins to the Host Cell. Cell. 2012 148(1-2):201-12. 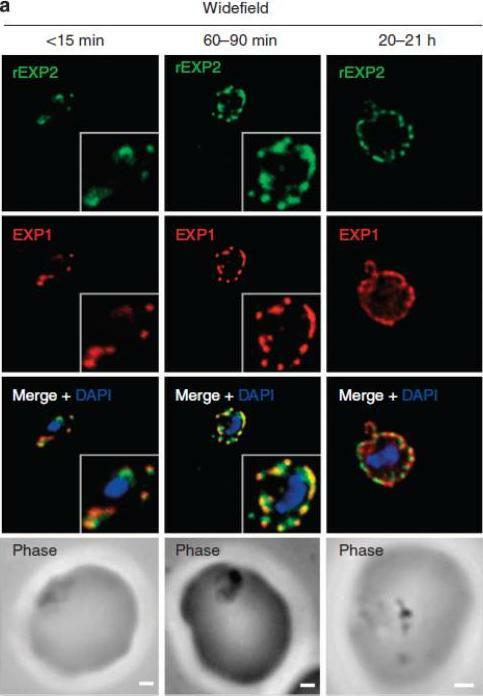 PfRON3 exists in parasitophorous vacuole in ring stage parasites. 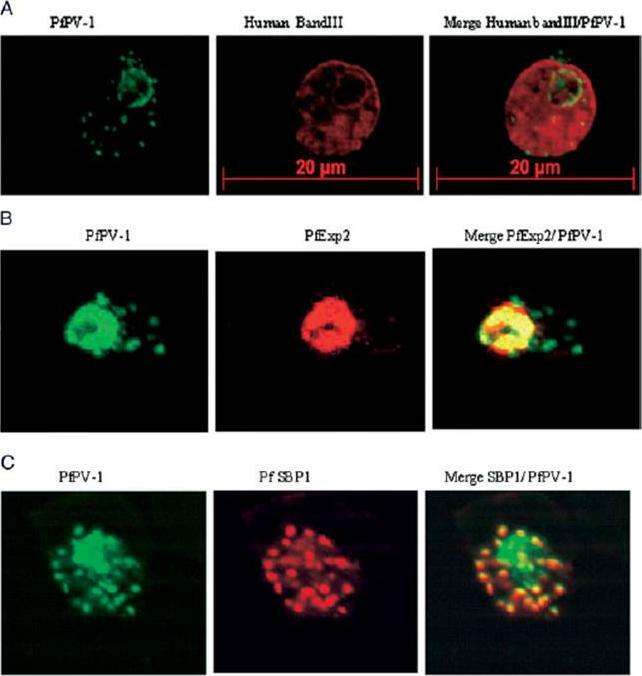 (A) Ring stage parasites were dual-labeled with antisera against PfRON3_1 and either PfRAP1 (PV marker), PfEXP2 (PVM marker), PfRON2, or PfRON4. Nuclei are visualized with DAPI in merged images shown in the right panels. 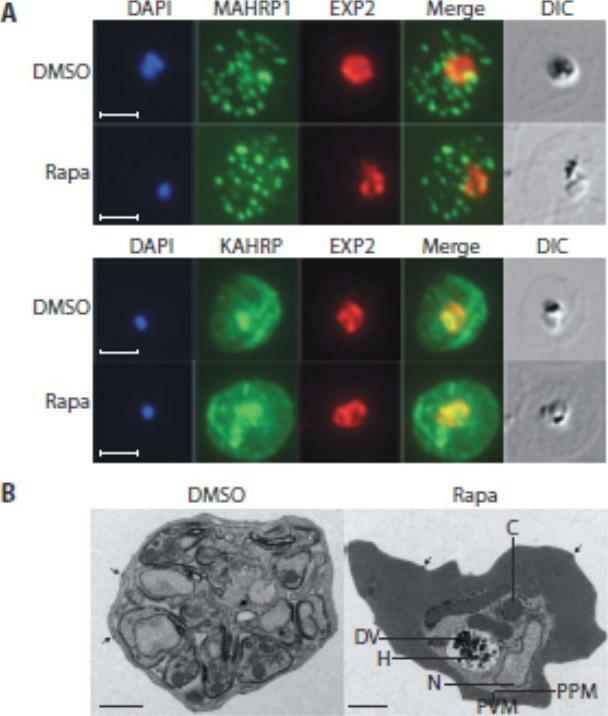 Bars represent 2.5 μm.Ito D, Han ET, Takeo S, Thongkukiatkul A, Otsuki H, Torii M, Tsuboi T. Plasmodial ortholog of Toxoplasma gondii rhoptry neck protein 3 is localized to the rhoptry body. Parasitol Int. 2011 60(2):132-8. PMV inhibition impairs protein export, PfEMP1 display, and cytoadherence. (A) (Top) Immunofluorescent micrographs show Hyp8-GFP (exported protein hyp8),is exported and localizes within puncta in the infected erythrocyte. (Middle) Hyp8-HA localizes within SBP1-containing MCs. (Right) Immunoelectron microscopy shows Hyp8-HA localization at MCs. Scale bar is 100 nm. Immunofluorescence microscopy showed Hyp8-GFP is exported and colocalizes with SBP1 in MCs(B) Maximum intensity projection micrographs showing export of Hyp8-GFP to MCs and secretion of EXP2 to the parasitophorous vacuole membrane following treatment with DMSO or 916 (50 mM). Puncta of nonexported GFP within the parasite and vacuole is shown (arrows)Sleebs BE, Lopaticki S, Marapana DS, O'Neill MT, Rajasekaran P, Gazdik M, Günther S, Whitehead LW, Lowes KN, Barfod L, Hviid L, Shaw PJ, Hodder AN, Smith BJ, Cowman AF, Boddey JA. Inhibition of Plasmepsin V Activity Demonstrates Its Essential Role in Protein Export, PfEMP1 Display, and Survival of Malaria Parasites. PLoS Biol. 2014 12(7):e1001897. 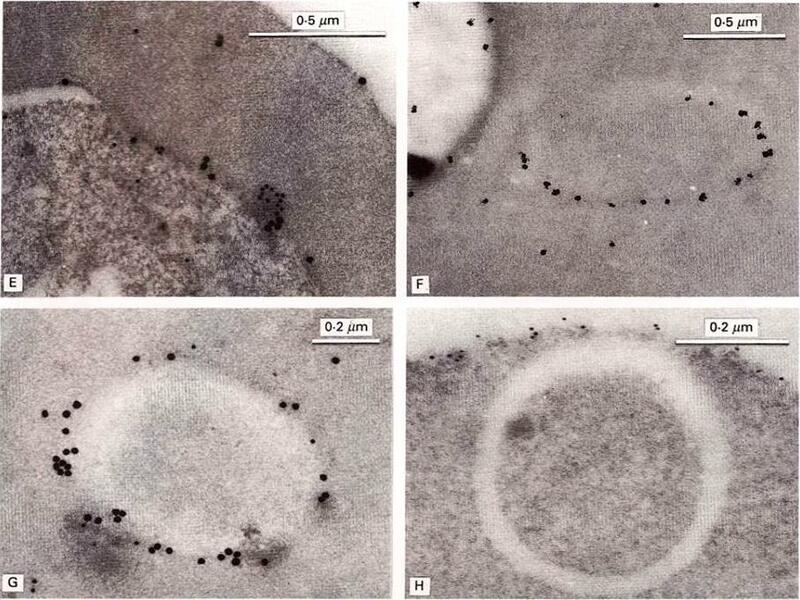 NanoLuc is targeted to the PV and to the RBC. Diagrams of gene constructs and the IFA images are shown on the left and right respectively. Nluc fused at its N-terminus to (A) the N-terminal region of an exported protein (PEXEL), (B) to a secretion signal peptide (SP) or (C) original (cytosolic). The gene encoding each fusion protein was cloned in the pEF vector. Transfected parasites were analysed by IFA using antibodies to detect Nluc and the PVM marker Exp2. DAPI was used for nuclear staining. Size bar = 5 mm.Azevedo MF, Nie CQ, Elsworth B, Charnaud SC, Sanders PR, Crabb BS, Gilson PR. Plasmodium falciparum transfected with ultra bright NanoLuc luciferase offers high sensitivity detection for the screening of growth and cellular trafficking inhibitors. PLoS One. 2014 Nov 13;9(11):e112571. Loss of PfTRiC-θ does not alter export of PfSBP1 or PfREX1. IFA of acetone-fixed ring-stage infected RBC. i) PfTRiC-θ ± 0.5 μM aTc (anhydrotetracycline), ii) HSP101 ± 10 μM trimethoprim (TMP). 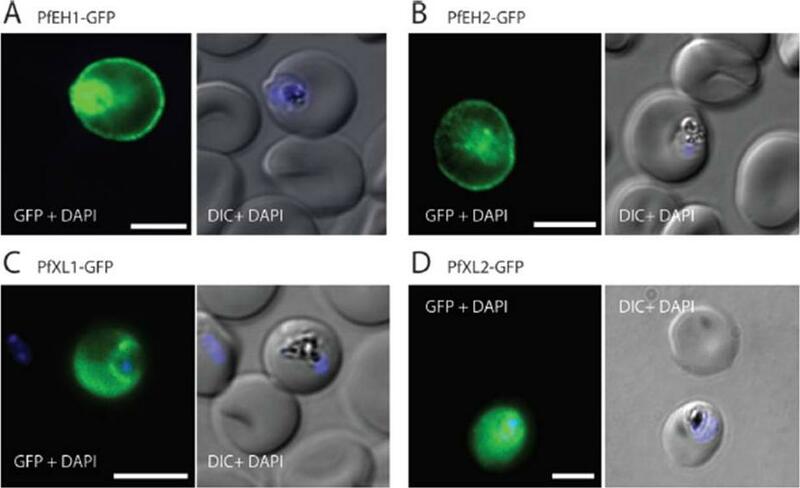 DAPI stains the parasite nuclei and PfEXP2 delineates the parasite parasitophorous vacuole compartment. Scale bars = 5 μm. Data are representative of two independent assays. DIC = differential interference contrast. Loss of the PfTRiC complex does not alter export of PfSBP1 or PfREX1 (i). This was in contrast to the block in export of PfSBP1 and PfREX1 observed upon TMP removal in the previously characterized PfHSP101-DDD line (ii).Spillman NJ, Beck JR, Ganesan SM, Niles JC, Goldberg DE. The chaperonin TRiC forms an oligomeric complex in the malaria parasite cytosol. Cell Microbiol. 2017 Jan 9.